When Orion returns from deep space missions and lands in the ocean, a team will be responsible for safely returning the capsule and crew back to land. 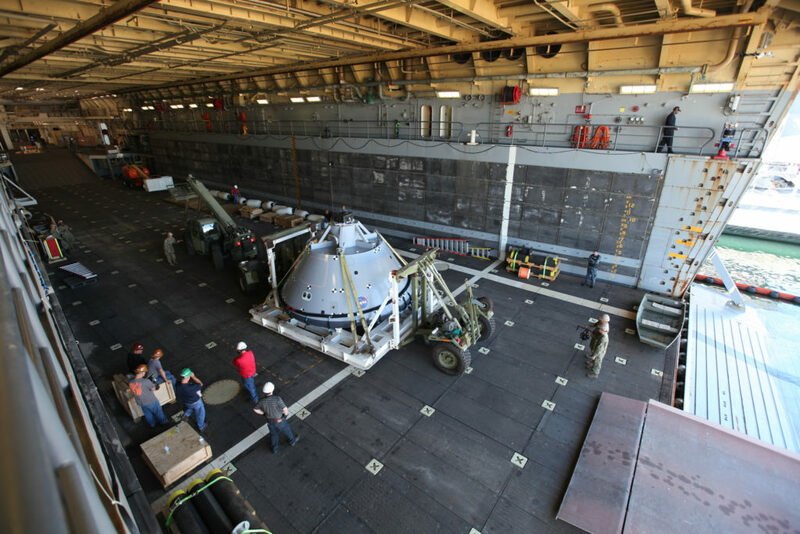 NASA’s Ground Systems Development and Operations Program and U.S. Navy personnel are preparing to conduct a water recovery test, called Underway Recovery Test 5 (URT-5), this week, using a test version of the Orion spacecraft in the Pacific Ocean. During URT-5, the team will demonstrate and evaluate in open water the recovery processes, procedures, hardware and personnel that are necessary for recovery of the Orion crew module into the well deck of a Navy ship. The USS San Diego, a test version of Orion, several support boats, and associated hardware and equipment will be used for the test. Orion is the exploration spacecraft designed to carry astronauts to destinations not yet explored by humans, including an asteroid and the agency’s Journey to Mars. It will have emergency abort capability, sustain the crew during space travel and provide safe re-entry from deep space return velocities. NASA’s Orion spacecraft is scheduled to launch atop the Space Launch System rocket in late 2018.